The line charts show the amount of beer sold to pubs and supermarkets over six years, where a bar graph displays the amount of pubs closed over the same period. 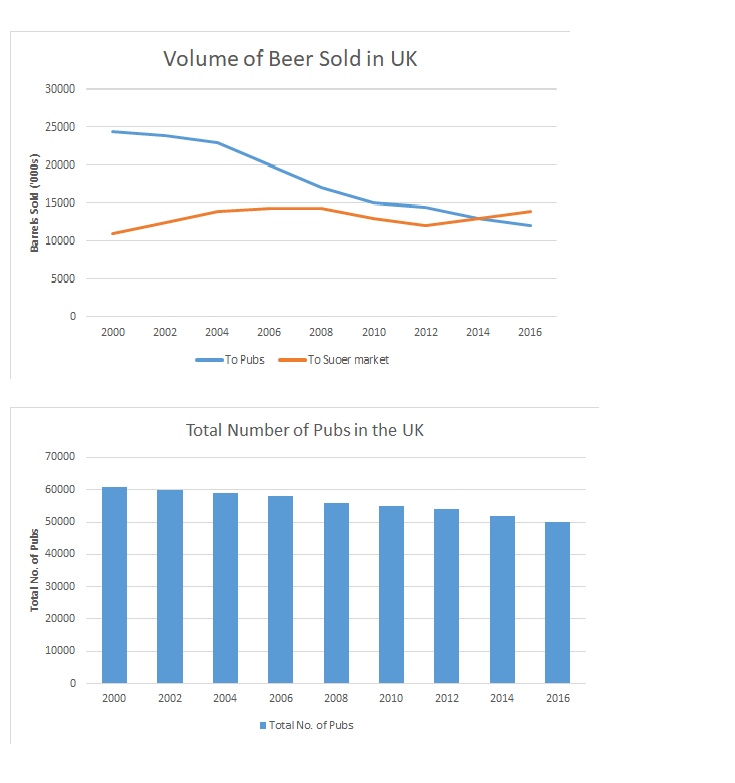 The line graph illustrates the number of barrels of beer sold in the UK to both pubs and supermarkets between 2000 and 2016, while the bar chart shows the total number of pubs open over the same period. Overall, people in the UK seemed to prefer to drink more at home than in pubs by 2016, which could have contributed to an increase in pub closures over that time. In 2000, the number of barrels sold to pubs in the UK began at over 23 million barrels of beer and steadily declined to around 12.5 million by 2016, approximately half its original figure. In contrast, barrels sold to supermarkets were initially half of those sold to supermarkets in 2000 at just 11 million, rising to around 14 million by 2004, before fluctuating slightly and then overtaking pub sales in 2014 to end 2016 at about 14.5 million barrels sold. In terms of UK pubs, there was a significant decline in the number of pubs between 2000 and 2016 from over 60,000 premises in 2000 to around 50,000 by 2016, seemingly reflecting the slowdown in beer consumption at such locations. It states the years and units given in both charts. The comparison begun by “which” relates the two graphs, but only suggests a possible trend rather than conclusively state as such. Describe beer sold to pubs first, then contrast with supermarkets. Use every chance here to draw comparisons. The sentence here begins by showing that beer sales to supermarkets were half of those to pubs in the first year, and then overtaking them by the final year. The key trend is that pub closures continued over the time period. An observation which connects both charts suggests a possible reason since this relates the two graphs to each other. The observation is added to the paragraph using an appositive. The line graph illustrates number of barrel of beer sell in UK to both pubs and supermarkets between 2000 and 2016, while bar chart shows the total number of pubs open over same period. Overall, people in the UK seemed prefer to drink more at home than in pubs by 2016, which could have contribute to increase in pub closures over the time. In 2000, the number of barrels sold to pubs in the UK begin at over 23 millions barrels of beer and steadily decline around 12.5 million by 2016, approximately half it’s original figure. In contrast, barrels sold to supermarkets are initially half of those sold to supermarkets in 2000 at just 11 million, rising at around 14 millions by 2004, before fluctuate slightly and then overtaking pub sales in 2014 to end 2016 about 14.5 million barrels sold. In term of UK pubs, there was significant decline in number of pub between 2000 and 2016 from over 60,000 premises in 2000 with around 50,000 by 2016, seemingly reflecting the slowdown in beer consumption at such location. Due to lifestyle changes of Britons?